2016 COM shows attended by IOA members. The show of Acala de Guardaria held in Seville Spain was attended by two IOA members from Gibraltar, John Canepa and Manolo Suetta. 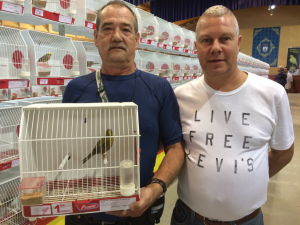 Entry of birds for the show was 3480 which included colour, type and European fauna. It also hosted in conjunction with Northern Frill monographice with 400 birds benched and the Gloster Monographic with 780 birds benched. It took 14 COM judges to judge the type section. Bronze with a Scotch Fancy.Manolo Suetta, Gold with a Lizard Canary and Silver with a Gloster Fancy.